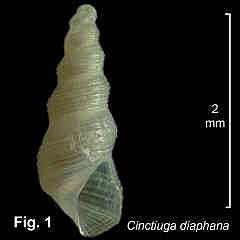 Description: Shell small, spire straight-sided, up to 6 whorls. Protoconch (Type B) coiled, set on teleoconch with axis inclined at about 110° to teleoconch axis, apex submerged. Teleoconch whorls uniformly rounded or weakly to strongly angled, sculptured with about 10 fine spiral threads; spirals continue onto base of last whorl; suture distinct. Aperture teardrop-shaped, length greater than width; no plaits on columella. Shell translucent becoming opaque white with age. Size: Up to 2.7 mm in length. Distribution: Specimens available from Australia, South Africa, Tanzania, and Papua New Guinea. In Australia, from Port Stephens, NSW, southwards and around southern Australia to south-western WA. Habitat: Most specimens are empty shells from beach washup and dredgings down to 20 m, but there are two lots that appear to be the same species form 93–114 m off Rottnest Island, WA. Common. Fig. 1: Batemans Bay, Surf Beach, NSW (C.342682).